The South Bronx has struggled for years with three of the most pressing social and economic inequities that affect urban, low-income communities of color: high unemployment, poor public health, and substandard housing conditions. Compared with other neighborhoods in New York City, the South Bronx community bears an unequal share of the burden in each of these areas. The South Bronx is home to the highest unemployment rate in the city at 12.6%, claims one of the highest rates of asthma and obesity in the country, and residents are exposed to housing infested with cockroaches, mold and other allergens at a higher rate than anywhere else in the City. After a year-long community visioning process, where members of MOM identified the need to address the intersecting issues of housing, environmental injustice and unemployment, members of MOM decided to research a public policy solution that could address each of these interrelated issues simultaneously. This solution is a green jobs program, which we define as employment opportunities that improve the environment. 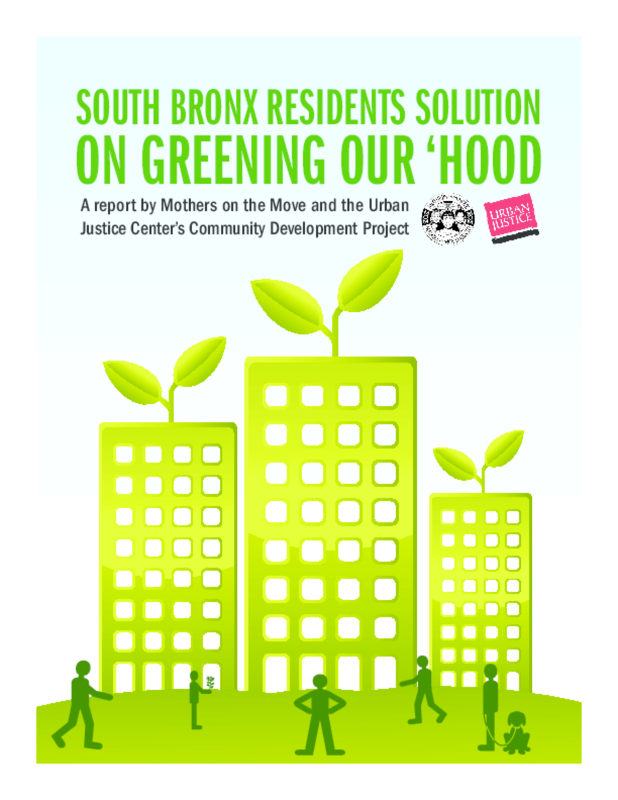 After surveying hundreds of residents in the South Bronx, and exploring a variety of existing and proposed green jobs programs found in New York and elsewhere throughout the country, members of MOM have decided to call for the creation of a green jobs program focused in the New York City Housing Authority to retrofit each of the South Bronx neighborhood's 90 public housing developments to be more energy efficient. If implemented successfully, this green jobs program could create thousands of new jobs while simultaneously improving public health and housing conditions for low-income South Bronx residents. Copyright 2011 Community Development Project at the Urban Justice Center, Mothers on the Move (MOM).